When you are looking for the most affordable and simplest option, you should go for Rio Beach Portable Sun Shelter as one of the cheap and best beach tents. 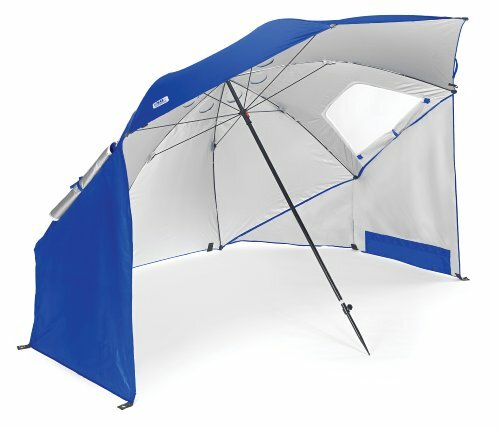 Available in navy/orange colors, this 9 by 4.5 by 4 feet (WxHxD), lightweight, freestanding, portable sun shelter can provide you SPF 50 sun protection. Its two exterior zip mesh windows ensure perfect ventilation and two interior pockets enable you to keep all your belongings. It is made of 75 denier polyester fabric which is waterproof and washable. You also get a carry bag with the tent. This is another highly affordable and a decent quality beach tent. With one of these, you can expect to get good protection from UV light and feel cool inside the tent as it is made of heavy-duty polyurethane-coated taffeta with the silver coating to deflect the sunlight. Durable polyurethane is used for its floor, so you can be assured that the floor will not be torn or get hold. You get a carrying bag and 4 weight sandbags with the tent. We have listed this tent in our beach tent reviews because of the quality and cheap price. 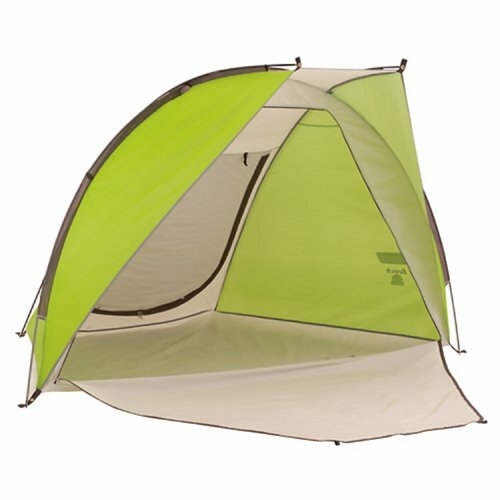 Coleman Compact Shade Shelter is one of the best beach tents you can ever have. 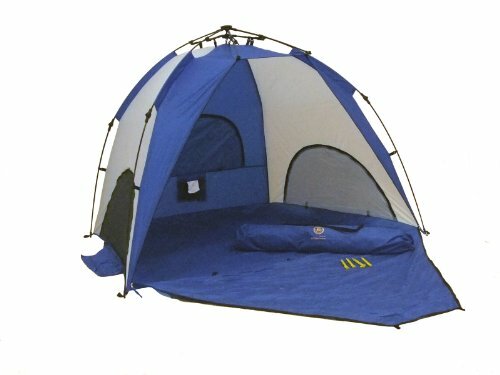 This is a cool and reliable tent we recommend for all kinds of beach trips. 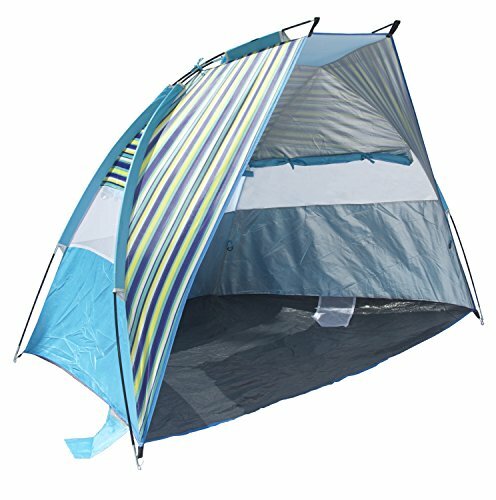 This durable, lightweight, portable and compact beach tent is designed to keep you protected from UV SPF 50+. Available in four different colors, Coleman Compact Shade Shelter comes with a floor mat, handy dry line, extra-long stakes, sandbags and a carrying bag. If you are not interested in doing much research and buy a beach tent that will most certainly make you happy, you should not look any further than this. This is a unique, interesting and stylish option you can go for. It’s different from the all other beach tents you will find around. It’s more like an umbrella than a tent. 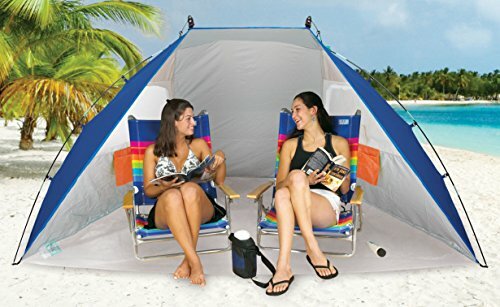 With over 2000 reviews on Amazon, it is one of the most popular and best beach tents. Available in red and blue, Sport-Brella Umbrella can provide you instant protection from wind, rain, and sun. Its side zipped windows and top wind vents ensure perfect and efficient airflow inside the tent. It comes with a carry bag with shoulder strap, and internal pockets for gear, valuables, and stakes. This one is another popular and high-quality beach tent perfect for any kind of beach vacation. It’s very easy to set up, lightweight, and durable. With the measurement of 96 x 54.5 x 49.25 (LxWxH), it can accommodate two adults and two kids comfortably with enough room for accessories, gears, and chairs. As it is made of polyester, it is waterproof and provides protection from UPF 50+ sun. Its 3 roll-up windows provide enough ventilation and privacy inside the tent. It includes a carrying case with shoulder strap, guylines, stakes and sand pockets. It might look a little costlier than the previous ones, but you get great value for your money. 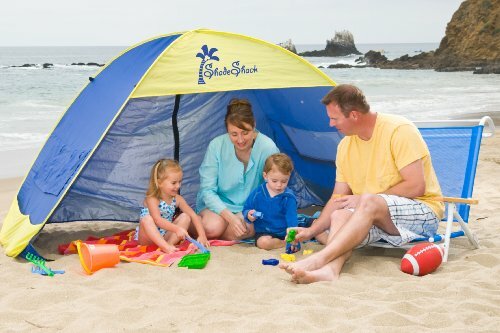 Could be one of the best beach tents for families that you can have. This is another Value-for-money beach tent you can choose without doing much research and any hesitation. Use of steel beam frame covered by 600D Oxford nylon makes it durable and lightweight. Setting up is extremely easy as it has a one-second self-expansion feature. It folds down in just 3 seconds as well. It comes with a full size carry bag with shoulder strap, sandbags pockets on both side panels, and four plastic ground stakes. It can accommodate a perfect family inside, making it one of the best beach tents available on market. Another wonderful family tent with the quality materials used. Its 190T Polyester Zinc Coated to 30+ UPF ensures you and your family are completely protected from UV sunlight, and the wind. Available in two different color combinations, this is a stylish tent both your spouse and kids should love to have. It is very easy to set up. So, if you are looking for a perfect family beach tent, you should consider this one or one of the previous two as all three are capable of accommodating a full family and have all the features necessary in a family beach tent. 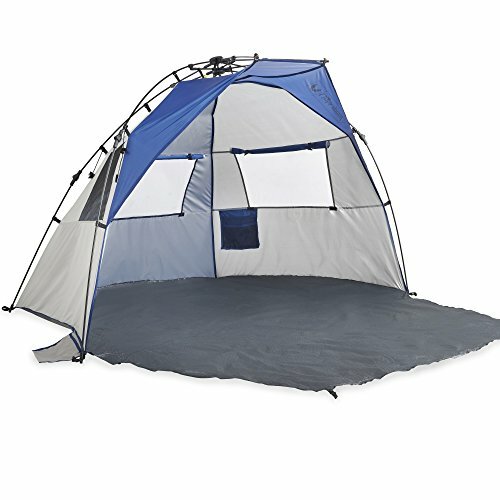 This is one relatively less affordable compared to all other beach tents listed here. But it is one of the best beach tents available in the market. Its tall and hexagon structure makes it unique. 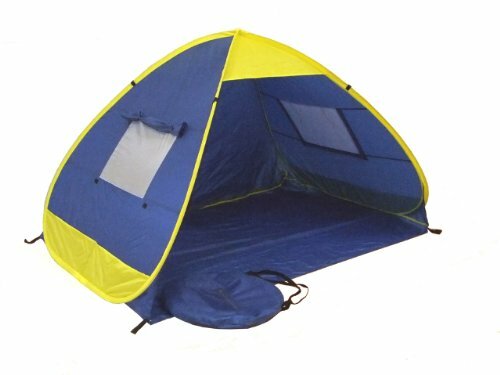 Made of important quality nylon, this wonderful beach tent comes with the durable fiberglass frame, a carrying bag, stakes, and ropes. It sets up and takes down in just three seconds. If you are looking for a spacious, durable and stylish beach tent and you have the budget, we recommend you to have this one. Which one to choose from these quality beach tents depends on your personal requirements and preferences. But we strongly believe you won’t lose if you have any of these tents. So, go ahead and buy the one that suits your requirements and make your beach holiday more exciting, enjoyable and memorable. We are sure this best beach tent reviews would be useful to find a suitable tent for families, babies, and toddlers.